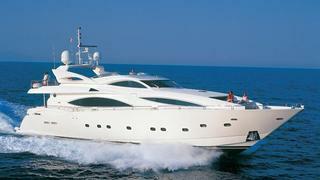 More sales news from Sunseeker London as Gary Cleaverly closes on the sale of the 31m superyacht Bunny. A Sunseeker 105 built by the famed British yard to RINA class and delivered in 2001, Bunny features a calm, relaxed interior in cherry wood with desert-coloured carpeting and cream leather furnishings. A spacious main saloon has comfortable sofas and formal dining for eight to 10 guests. Accommodation is for eight guests in a full-beam master suite on the main deck with a walk-in wardrobe, mini bar and an en suite spa bath and shower. Below, there is a full beam VIP and port and starboard twin cabins, all with en suite facilities. The flybridge is exceptional and was designed for entertaining and relaxing al fresco. It features a bar area with a fridge, grill and spa tub together with seating and dining spots along with a crane for launching tenders or jet bikes. Twin 1,800hp MTU give her speeds of up to 25 knots and Bunny was asking £1,795,000.